While we at Queal aren’t the kind of people to look at the dark side of things, there is one subject that has come to our attention lately. That subject is sustainability. While awareness in the world for a sustainable future is growing, we think we need to shift to a higher gear. People are starting to realise that it is not just cars and planes that have a large carbon footprint. Not only fossil fuels, but our own fuels are one of the main contributors to global pollution and greenhouse gas emissions! What will the future of food look like? Let’s take a look at a few sustainability factors of traditional foods and compare them to Queal. One of the most contributing factors to greenhouse gases is the global distribution of food. Take Europe, for example. The EU imports the equivalent of 35% of its farmland from outside the EU(1). That’s a volume as big as the entirety of Germany. The import has grown from 107 million in 2000 to 132 million tonnes of food in 2008. Most of these countries aren’t exactly next door either. The EU’s import of agricultural products is mainly from countries like Brazil, the US, Indonesia, China and India(2). Now, that means loads of trucks and boats travelling all over the world, burning fossil fuels in the process. The authors of the first article also mention that faced with the increase in global food demand by 2050 and because of the rapid importation growth, the EU must improve its agricultural yields. With wheat, for example, the yields have only been increasing by 0.6% annually. This growth should increase drastically to reduce EU import (the article describes a scenario of a 50% growth in increase). 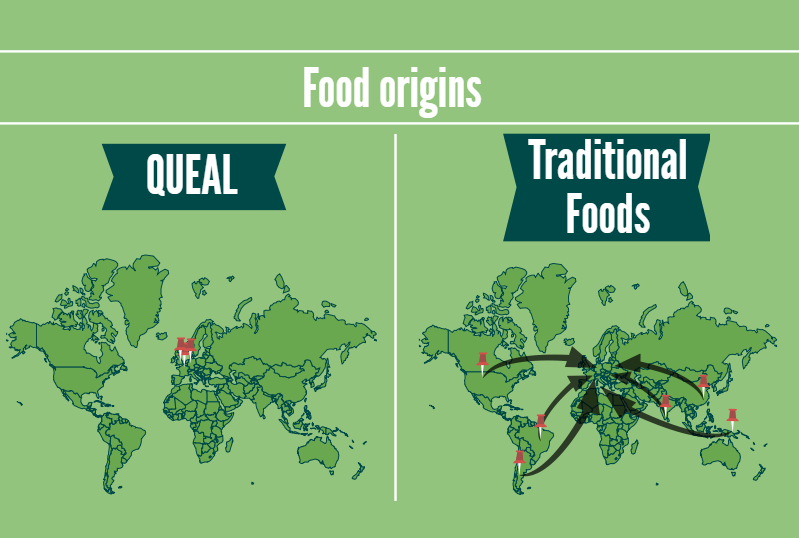 All of Queal’s main ingredients come from the EU. Countries range from the UK to Belgium and Germany. This means less transportation of ingredients and no import from outside of the EU, increasing yields for European farmers. You can imagine how this affects greenhouse gas emission! Another shocking fact about food production is the amount that ends up in trash. About 24% of calories or 32% of all food produced in the world was lost or wasted in 2009(3). As stated in this article, food loss and waste have a negative impact on both economic and environmental factors. Economically, food loss is a wasted investment and reduces farmers’ incomes, while it increases the cost for consumers. Environmentally, food loss implies unnecessary greenhouse gas emissions and inefficiently used water and land. The latter can also lead to a diminished natural ecosystem. A reasonable argument made by the article is that big losses are an opportunity for savings. 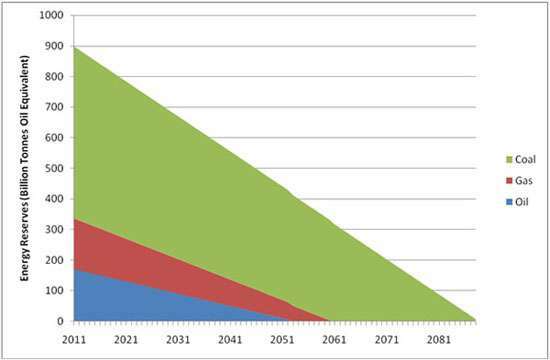 It estimates that if food waste is cut in half by 2050, we would need 1,314 trillion kilocalories less food per year than in the business-as-usual global food requirements scenario described in The Great Balancing Act(4). This act describes how the world can adequately feed more than 9 billion people by 2050 in a manner that advances economic development and reduces pressure on the environment. 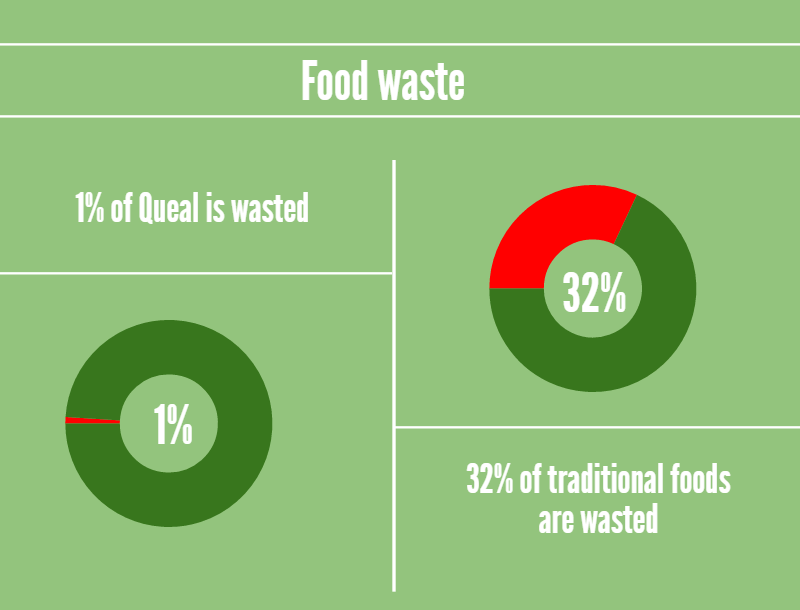 Let’s compare food waste and food spoilage of average foods with Queal. While occasionally a bag of Queal gets thrown away, it is safe to assume that almost all of it is consumed. Though not everyone eats Queal three times a day (so this graph is a bit optimistic), replacing one meal a day would already have a big impact. As you notice, Queal is very efficient in that almost all of the Queal produced will find a way to your stomach. Compare that to the 32% of food that gets thrown away, is spoiled, or never even sees the light of day and you can imagine the sustainability issue here. Another graph shows the shelf life of different types of food compared to Queal. 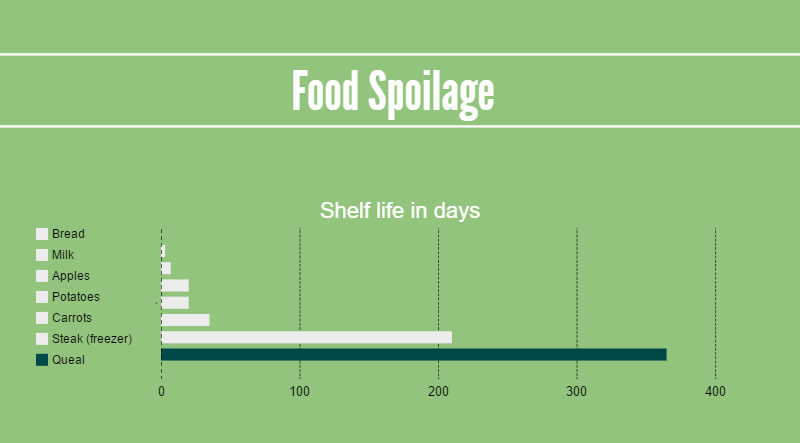 A large part of the above-mentioned food waste is due to the rate of spoilage of many of our everyday foods. Because Queal is dry, it has a shelf life of at least one year when opened (and even longer when unopened). Compared to your everyday breakfast of, for example, bread, milk and fruit, it just lasts so much longer and you end up throwing away probably nothing. This is good for the environment, and it saves some money along the way. For our first blog about sustainability, Floris wrote about the ingredients of Queal and their impact on sustainability (read it here!). We got a very helpful comment from Jeroen M. (thanks a lot!) that pointed out some more environmental advantages of eating Queal. Some of which were covered here, such as spoilage and waste. But he also pointed out that our packaging is about as optimal as it gets and the weight/volume/nutritional value ratio is unbeatable. These are subjects we’re also looking into and we will definitely come back to all of you with some more research!